Griselinia is a dense evergreen hedge plant with soft, glossy apple green leaves on soft green stems. It does well when trimmed to shape and quickly establishes a mature hedge. Its growth rate is average at approx. 30cm p.a. and it is easy to trim so it's a great low maintenance evergreen hedging plant (though all hedges need maintenance!). Griselinia prefers full sun and a light, well-drained soil and is one of the most suitable species for seaside gardens. For a colourful, variegated variety, see our range of Griselinia Dixon's Cream hedging, or take a look at our large range of colourful hedging plants. Trading online for over 11 years, Hedges Direct are specialist suppliers of hedging, pleached and ornamental trees, living screens, topiary and turf. With decades of experience in the horticultural industry and a culture firmly focused on quality and service, we are able to supply specimen plants for any size project or garden, all with an industry leading delivery turnaround. Our award-winning sales and service team are available 6 days a week and 7 in peak planting season, offering bespoke quotes, expert advice and exclusive trade and retail discounts. We offer next day, weekend and specified delivery dates and we’ll deliver direct to your home or your client’s address, on a day to suit you, with no signature required. With our own plant nursery and an extensive network of growers across the UK and Europe, if we don’t stock it, we can usually source it so please get in touch with your requirements. Hedges Direct have been supplying ITV’s Love Your Programme Television Series since 2013. Hedges Direct are proud to have been recognised as a Gold Trusted Merchant by Feefo and Garden Retail Awards 2017 by Horticulture Week. As a nationwide supplier of hedging plants (amongst other things) we are regularly asked by our customers for recommended horticulture experts in their area. The Hedging Network was created to bring together a selection of reputable and experienced landscapers and garden designers from around the country, in order to display their contact details in one location. Joining The Hedging Network allows your company details to be visible to the thousands of potential customers browsing our website every day. As an Approved Member, our sales team are able to refer customers directly to you when placing their order. We’ve received a lot of positive feedback from Approved Members and it’s completely FREE to join! In addition to your contact details being visible within our database, a direct link to your website will also be included so that browsing customers can easily access more information if it was needed. An Approved Member has full access to our approved badge which can be displayed on your website so you can showcase your membership and advertise that your company demonstrates the high level of quality service and expertise required to meet The Hedging Network criteria. We also broadcast our new joiners on our social media pages, reaching even more clientele. 10/04/2019 - Bargain bundles are back! Don't miss out! Bargain Bundles Are Now Available! 22/03/2019 - Mothers Day gifts to treasure forever! Choose A Forever Gift This Mother's Day From Our Stunning Ornamental and Fruit Tree Collection. 22/03/2019 - Think outside the box this spring in your garden! Give your garden a present - in a Box! 11/03/2019 - Super spring savings on hedging - Limited stock, Buy Now! Limited Time Special Offers On Hedging Plants! 14/01/2019 - Bare Root Hedging - The Popular Choice! What is bare root hedging? 17/12/2018 - Brand New Christmas Product Range! We are really pleased to bring you a fantastic new range of products ideal for the home or as a gift this Christmas. 24/05/2018 - Hedges Direct partners ITV’s ‘Love Your Garden’ for NHS 70th Anniversary Special. 22/05/2018 - Luscious Lavender is now in stock and it's stunning! From the soft tones and subtle spires of classic English Lavender, the unique appearance of the tufty eared, lilac shaded French Lavender or the rich purple deeper hued Hidcote Lavender, we have a selection to stun and soothe the senses. 25/04/2018 - Get super discounted bare root hedging bundles! Don't Delay - Bag a Bargain Bundle Now! Order Now To Guarantee Delivery Before Easter! 12/03/2018 - New Look - Same Great Service! 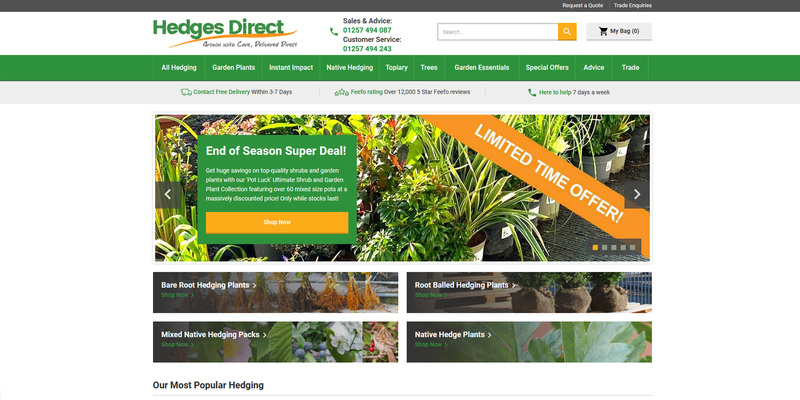 This week at Hedges Direct: we've had a facelift! Below are some of the budget bare root bargains available now on the most popular species. So far, January has been pretty cold and miserable so we thought we'd add some cheer to our chilly grey days and bring you some lovely special offers on a selection of our more popular bare root hedging species. With Christmas and Winter approaching fast we thought we'd focus on some of the more seasonal bare root choices available to you if you want a hedge that provides interest in your garden at this time of year! As we wake up to frost on our cars and the heating bill increasing over the next few months, it’s safe to say that the love-hate relationship we have with Winter is upon us. Bare Roots Are On Their Way! Staff polite, friendly and helpful. Product fine and delivered on time and I am sure will be great if the deer leave them alone! Thank you. Great range on the website. Customer services very knowledgeable and got straight through. You are likely to receive better quality responses if you enter a detailed description. Approved Business takes no responsibility for services that are provided by others as a result of you using this service.